CNRP spokesman Yim Sovann said Thursday that a group of businessmen close to the opposition has successfully registered a company with the Ministry of Commerce that will hold the television license promised to the party. Mr. Sovann said that the CNRP received notice in the past week that its application to register the company, which is called Cambodian Independent Media, had been approved. “We have had a response, and the company is already registered and the company presently is in the process of sending a letter to the prime minister,” Mr. Sovann said. An official at the Ministry of Commerce, who asked not to be named because he is not authorized to speak to the media, confirmed the successful registration. 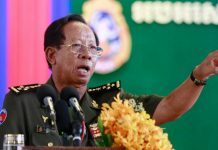 “This company was registered on the 20th of October, 2014, and the name is Cambodia Independent Media Co. Ltd.,” the official said. Mr. Sovann said last month that the CNRP’s TV station will be owned by people close to the party but will otherwise operate autonomously. He said that the party’s leaders would not interfere in the content of the station’s news. He declined to give the names of the people behind the station but said that the CNRP would reveal them soon. “They will come together soon. Some of the people are in France, and some of the stakeholders are in other countries, and they will come together next week,” Mr. Sovann said. 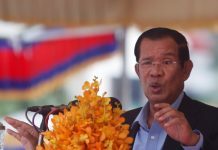 Prime Minister Hun Sen pledged earlier this year that the government would approve an opposition-run station if CNRP President Sam Rainsy registered a private firm and then applied to the government for a television license. 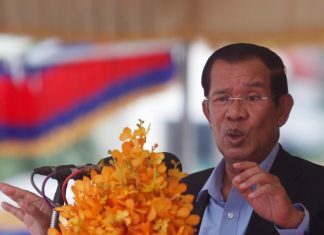 The pledge was offered to the CNRP as an incentive to end its protests against the results of the disputed July 2013 election. The CNRP’s new terrestrial television station would be the first to be operated by an opposition party in Cambodia. The country’s nine terrestrial television networks are all either owned by CPP officials or seemingly infatuated with the ruling party, and the opposition has long complained that other parties are blacked out of their news coverage.